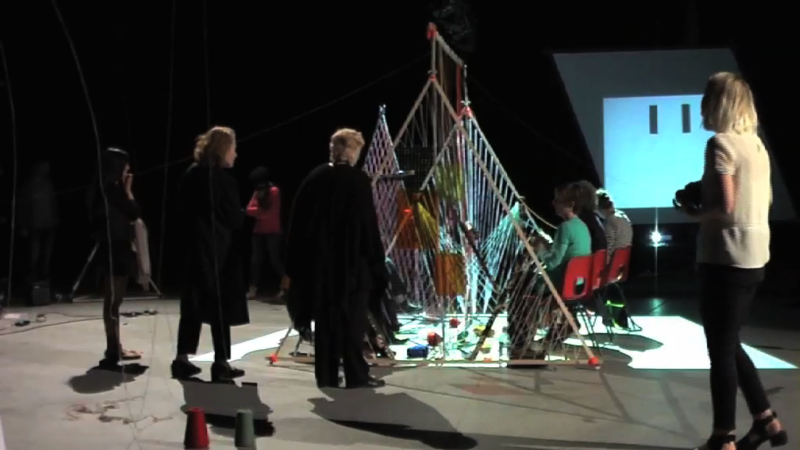 For one afternoon, the Backstage Centre in Thurrock, Essex, became a space where the group dynamics of the community, an elemental part of the works, evolved inside and around the sculptures and structures. 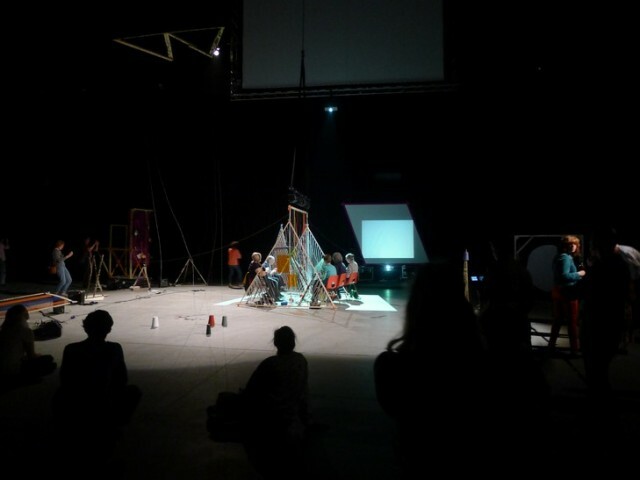 Each of these were choreographed one after the other across one space generating a changing set of rhythm and tempo. Stephen Cripps’ Studio Award, an Acme Residency & Awards Programme funded by The Henry Moore Foundation, Royal Opera House, High House Production Park Ltd and Stephen Cripps’s family. 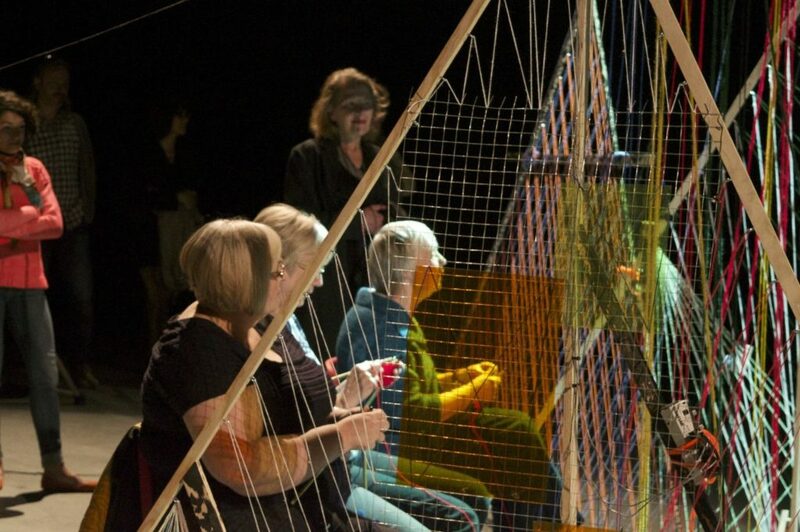 “Fundamentally a giant amplified loom, the Matrix is attended to by Leslie Robinson and five other women of the Thurrock knitting circle. 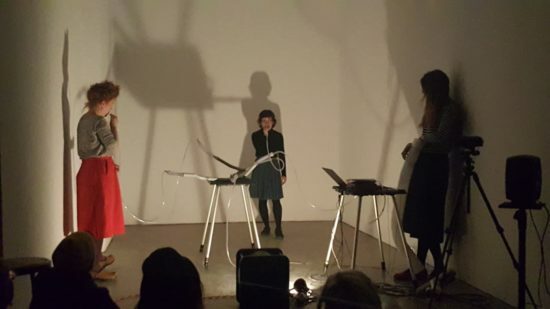 Sat three to each side of the Matrix, which draws out strands of wool from various external spindle edifices, each performer is allotted a particular colour of wool and each is equipped with a pair of metal knitting needles containing microphones. The frame of the Matrix itself is also implanted with microphones as are the feeding spindles. 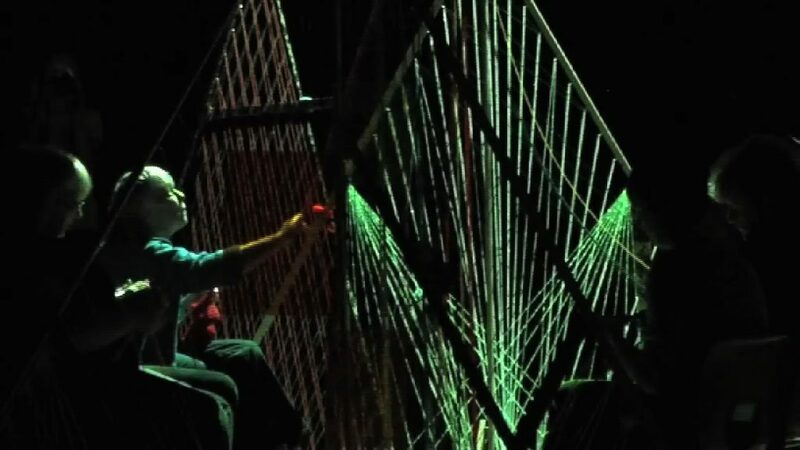 The process of their knitting (and the ensuing sounds) is regulated by a score comprised of shapes and projected onto a large light screen, dominating one end of the Matrix. 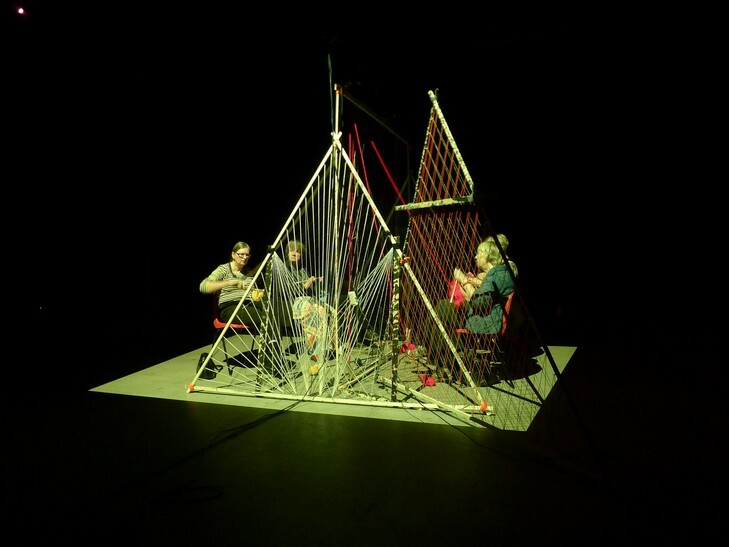 The score itself, generated and monitored by Evans is, however, interactive with the progress of the performance and (as the work progresses) the knitters’ audio signals directly feed into the outcome of the ‘score’ projections. The overall impression, therefore, engendered by this thirty minute performance is disparate, expressive and complex. Visually, while the knitting circle retain both a quotidian and ‘comforting’ element to their appearance (and there is, perhaps, a gentle humour in this) they acquire, through the evident concentration and cross communication involved and the somewhat foreboding aspect of the Matrix itself, a resemblance to women working in war time telephone exchanges, cross wiring vital conversations over time and space. There is also a suggestion of the mythological Ancient Greek ‘Moirai’ who spin the threads of Destiny or, due to the considerable dimensions of the Matrix, the ‘Norns’ of Germanic myth, female giantesses and weavers of Fate. Central to Evans concern, here, is the dictatorial nature of any given ‘score’ and how far the ‘above to below’ relationship between composer and performer can be reworked and inverted, aiming specifically at gaining access to the fresh creative ground that can be explored by use of this process. 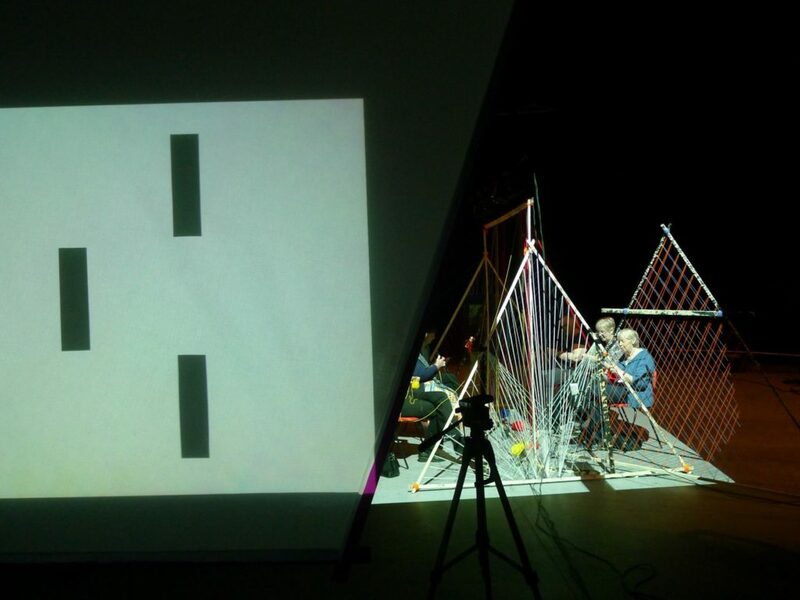 A close inspection of the projected score and the knitter’s reactions to it reveal a complex and ever mutating situation. The on-screen appearance of Bar shapes, reminiscent of I Ching hexagrams, attempt to dictate which of the knitters are to be active (and to what extent) at any given time. 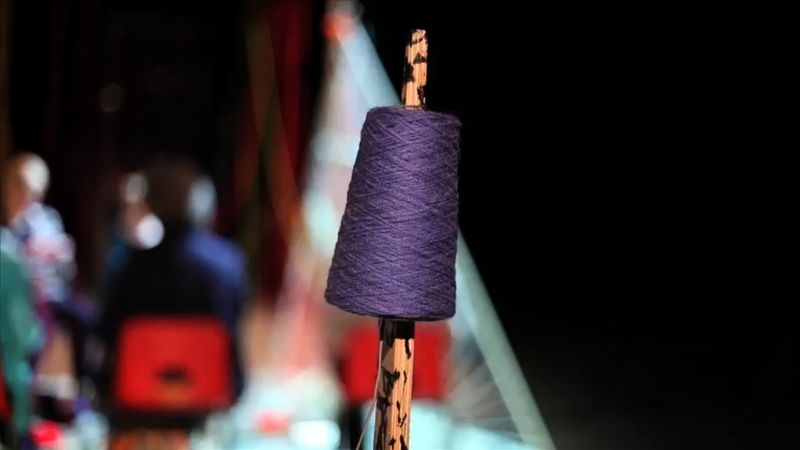 A white pulse light offers a set rhythm for each performer to knit in synch to, at which point the video screen (Evans’ software linking audio to video, via the microphones) swaps control to the knitters themselves and the colour flashes on the screen strobe directly to the sound of the amplified needles. 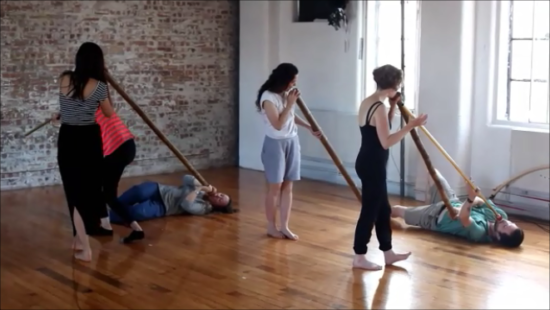 In this manner the performers proceed to take ownership of the piece and, each reacting to the patterns set by the other individuals, an aural ‘social event’ is created, reflective of the quality of group communication found within any given knitting circle. Any single performance of this piece will, of necessity, be different from any other as much as any particular conversation is different from the next, containing elements of risk and spontaneity, although each version will spring from the same original structure. 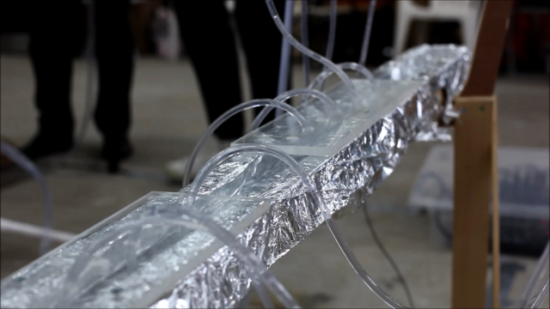 In Wool Matrix, Evans has fashioned a form of ‘sculpture as epigenesis’. Sonically, the amplified needles create a peculiar and oddly naturalistic sound, rather akin to multiple pebbles being dropped onto wooden surfaces, in which polyrhythms ebb and flow. This rippling surface of sound is regularly cut through, however, by any pull on the external spindles which generates an almost alarming, basso profundo, rasp, akin to the creaking of a ship’s rigging in high wind.